And They Call Him... Wha? or: Can I Keep It, Mom? When I was a little kid, what I really wanted for Christmas was a Siberian tiger, or a grizzly bear. A Komodo dragon would be nice. But, nooooo! All Mom and Dad would let me have was a dog. Two actually. And a passel of cats. And a ton of fish. Never got to keep a single snake I caught. Then there was the great Tarantula incident of 1970... poor Mom. All of this is to say I've always loved animals, especially large carnivores. Gorillas are cool as vegetarians go. Kraven the hunter and I just hit it off. He never struck me as all that bad. He just wanted an exuberant game of tag... and then mount your head to the wall. But, that name. I can't believe Steve "A is A" Ditko came up with that. I blame Stan. 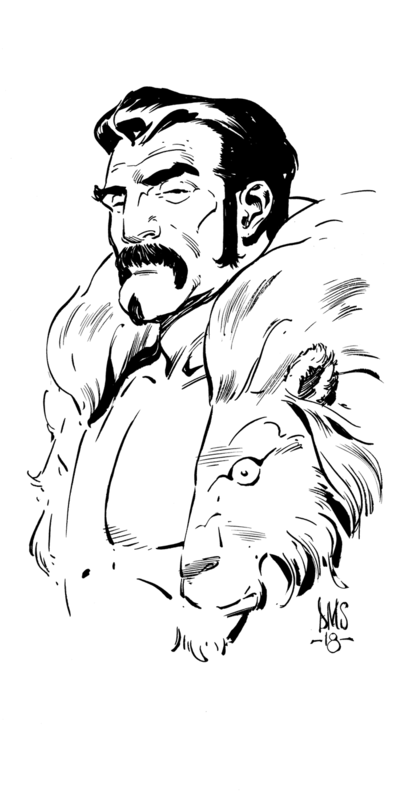 It says a LOT about Kraven's design that it's still used fifty-odd years later! I even have a great little Kraven action-figure next to my own art desk!